Nanoparticle-based consumer products are becoming available in the market at an increasing rate, but the safety of nanoparticles and the environmental fate of nanoparticles derived from consumer products have not been studied. We are using inductively coupled plasma mass spectrometry (ICP-MS) to study the potential release of significant concentrations of metallic nanoparticles from consumer products into the environment. New nanotechnology-based consumer products are currently entering the market at a rate of 3 or 4 per week, and it is estimated that $2.6 trillion in manufactured goods will contain nanotechnology by 2014. Unfortunately, the overall safety of short- and long-term exposure to nanoparticles and the environmental impact of the widespread use of nanoparticles remain relatively unknown. For example, silver nanoparticles have been incorporated into children's toys and food storage containers as an antibacterial agent. Because silver and other heavy metals are known to be detrimental to human and environmental health, we are studying quantitatively the temporal transfer of metallic nanoparticles from consumer products to environmental settings. optimized the washout solution and analytical measurement method for gold. 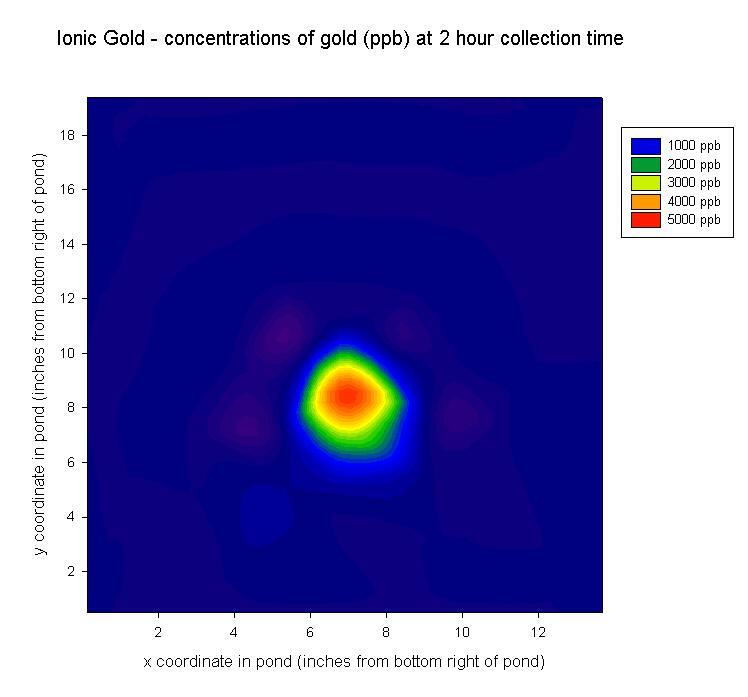 Figure 1: Contour plot of the concentration of gold in the pond 2 hours after the release of 48 µg/g ionic gold SRM 3121. After two hours, the gold had not yet dispersed significantly, and large amounts were still concentrated at the contamination site. 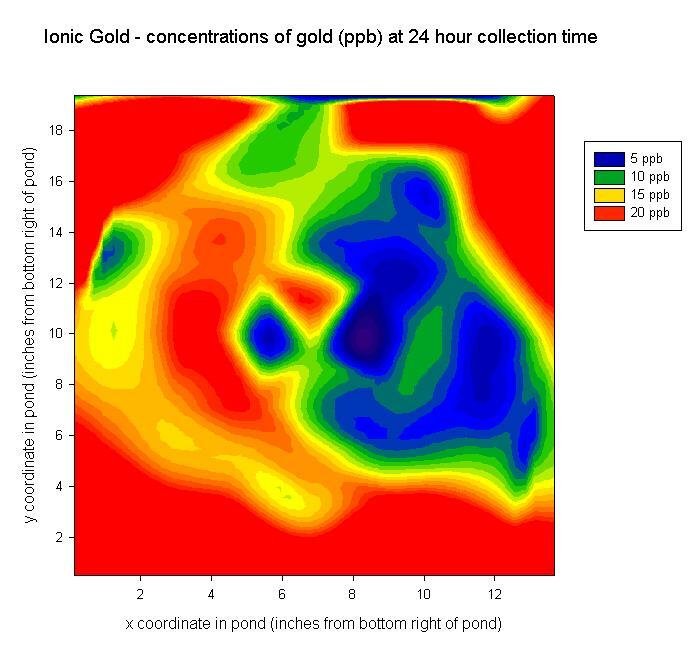 Figure 2: Contour plot of the concentration of gold in the pond 24 hours after the release of 48 µg/g ionic gold SRM 3121. After 24 hours, the gold appears to have dispersed relatively evenly among all points in the pond. In this work, we are using ICP-MS to quantify, track, and compare the temporal behaviors of ionic and nanoparticle metal species in a simplified aquatic environment. We are interested in learning whether or not significant amounts of nanoparticles can be leached from consumer products into the environment. Currently, the most commonly used metal nanoparticles in consumer products have been gold, silver, zinc, and titanium. Research on gold-containing products is currently in progress. We have simulated small, shallow ponds into which ionic standards, nanoparticle reference materials, and consumer products are released. Each pond had 50 sampling sites, and water was collected from each site at 2, 4, 8, and 24 hours after release. The concentration of metal at each site was then quantified as a function of position relative to the release and sampling time using ICP-MS. The total concentration of nanoparticles in each consumer product was also quantified using ICP-MS.